Wind power uses the kinetic energy of the air, in motion due to differences in the atmospheric pressure from one region to another. Differences in pressure have thermal origin and are associated with the heating process of the air, as well as of the continents and of the sea. Wind power is used directly to generate mechanical energy or indirectly to generate electrical energy. Wind power is an abundant, affordable and renewable natural resource. The energy of the wind was harnessed in ancestral times for a variety of uses, including to move sailing ships (more than 5000 years ago in river navigation), and for centuries before the Christian era to operate windmills and to pump water from wells. In the last decade the use of the wind has been one of the most attractive forms of electricity generation, despite the implications derived from the irregularity of the wind flows. Wind turbines convert the kinetic energy of the wind into mechanical energy, which, in turn, powers electric generators, coupled to the turbines, through which electricity is generated. Electricity is then supplied to households and production facilities by means of a grid of electrical lines. Wind farms include one or more towers equipped with blades – the wind turbines – which, turned by the action of the wind, spin the electric generator and generate electricity. The wind turbines most commonly used in Portugal are the horizontal-axis turbines (like the old windmills). The technology involved in manufacturing and operating wind turbines has evolved significantly due to the technological development in areas such as materials, engineering, electronics and aerodynamics. Wind turbines, regardless of their size, include the following components: the rotor (the part that rotates by the action of the wind and which the blades are fixed to), the electric generator and a control system, inside the nacelle, and the tower that supports the wind turbine. The energy generated by a wind turbine depends on the density of the air (variation with increasing humidity), on the area covered by the rotation of the blades (propellers) and mostly on the wind speed. Consequently, wind turbines are installed in high wind potential sites, i.e., windy areas. As wind speed is affected by the soil relief, and as it increases further off the ground, turbines are erected on tall towers above the ground surface. Because of the geography and geomorphology of mainland Portugal, it is mostly in the mountainous and coastal areas that the wind speed and regularity have energy-harnessing capabilities. Most of the sites with these characteristics are located in the coastal and in the most elevated areas north of the river Tagus, in the West and in the South near the Costa Vicentina. 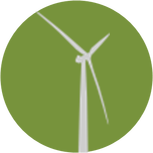 According to DGEG’s data, relating to December 2017, 2743 wind turbines are erected in Portugal, corresponding to an installed capacity of 5313 MW. Energy production from wind represented 24% of the final electricity consumption at the end of that same year of 2017.
it promotes the creation of employment during the construction phase and during the operation and maintenance phase of the wind farms.